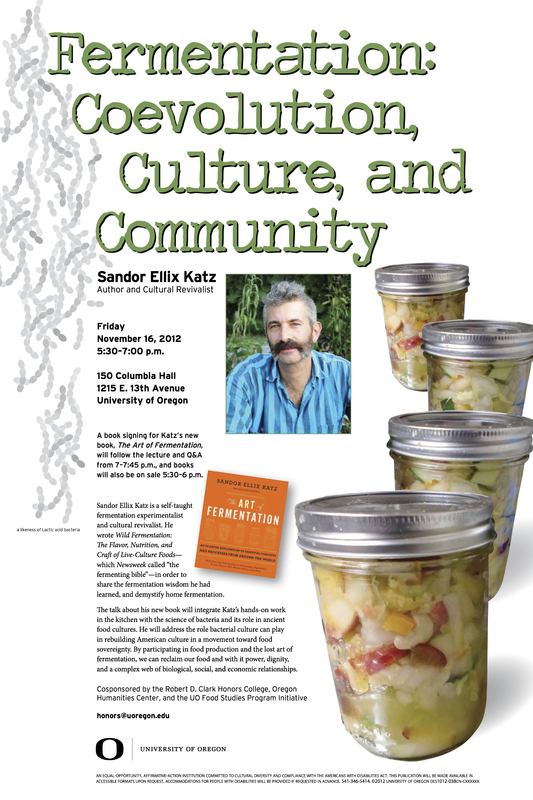 In honor of Sandor Katz’s visit to Eugene tomorrow (join us at 5:30 on the UO campus in Columbia 150! ), I thought I’d post my latest kim chi recipe. I was looking for a “white” or no-chili-powder, garlicky, gingery version of the classic juicy winter kim chi made with napa cabbage. And this one came out perfectly. The Asian pear stays clean and white, and the cabbage turns a beautiful pale yellow. See? If you’re in Eugene, you can easily find Asian pears at the local farmers markets. We had a great crop this year. It’s worth it to head out to RiverBend Farm south of Eugene, where they’re still available for u-pick at the cut-rate price of $0.70/lb. Asian pears can beautifully and bake into firm, bright pies. Just remember you’ll need to follow canning instructions carefully in a tested book, as they are a low-acid fruit. You will also need a bowl or crock large enough to hold cabbage and 8 cups water, plus a weight to submerge the cabbage. This could be as simple as a dinner plate with a jar full of water on top. Prepare the cabbage for a 4 to 12-hour soak in salt water. Mix water and salt, let sit while you wash and core the cabbage. Slice the cabbage and cut into pieces about 2-inches square. Place in a bowl or crock for the soak, pour the salted water and any salt that has not dissolved atop the cabbage and mix gently using your hands. Weight the cabbage, cover the bowl with a towel, and let sit on the counter for 4 to 12 hours. When you are ready to make the kim chi, drain and rinse the cabbage, and return to the large bowl or another vessel suitable for fermentation with a weight to press down the kim chi. Cut up the radish, scallions, and Asian pears. Prepare the souse: combine the ginger, garlic, shrimp, and sugar in a food processor bowl, and process to a paste. Scrape out the paste and combine with the cabbage, mixing well with your hands. Add the vegetables and pears, toss lightly. Press mixture down in your fermenting vessel, then add weight and let sit on counter for 1-3 days, testing each day for a taste you like. Refrigerate for 2-3 days for best taste. It will last for at least a week in the refrigerator. Makes about 2 quarts. I’m just getting started on fermentation (again), so your instructions came at the right time. I do love ginger! What a lovely idea to add Asian pears to kimchi! That’s like adding apples to sauerkraut. We had white kimchi at our local Korean restaurant on Friday! It was so delicious we asked for seconds. 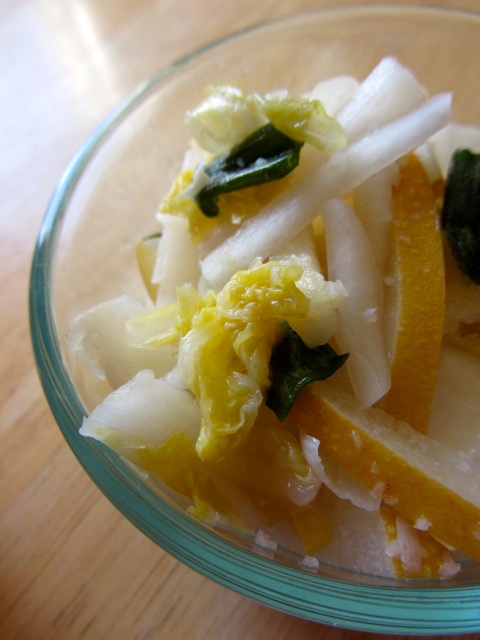 It has cabbage, pears, carrots, and another unidentified root vegetable, sliced very thin. I will definitely be making this!